GTM Research and the Solar Energy Industries Association® (SEIA®) today released U.S. 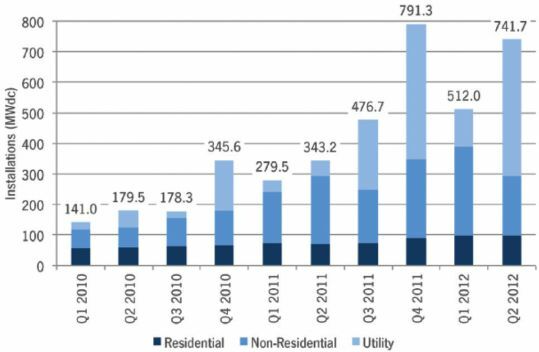 Solar Market Insight: 2nd Quarter 2012. The report finds that U.S. solar achieved its second-best quarter in history, having installed 742 megawatts of solar power, and the best quarter on record for the utility market segment. Utility installations hit 477 megawatts in the second quarter, with eight states posting utility installations of 10 megawatts or greater: California, Arizona, Nevada, Texas, Illinois, North Carolina, New Mexico, and New Jersey. In total, the U.S. now has 5,700 megawatts of installed solar capacity, enough to power more than 940,000 households. According to U.S. Solar Market Insight: 2nd Quarter 2012, the utility photovoltaic (PV) market will remain strong through the last two quarters of 2012. With 3,400 megawatts of utility PV projects currently under construction, and weighted U.S. average system prices 10 percent lower than the previous quarter, GTM Research forecasts an additional 1.1 gigawatts of utility PV to begin operating before year’s end. The report forecasts a total of 3200 megawatts, or 3.2 gigawatts, of PV will be installed in the U.S. in 2012, up 71 percent over 2011. Note: Figure for PV installations above does not include 30-megawatt CPV project installed in Q2 2012 characterized as concentrating solar power within the report. For the fourth consecutive quarter, the U.S. residential solar market grew incrementally, installing 98.2 megawatts. California, Arizona, and New Jersey led residential installations nationally, with smaller-market states of Hawaii, Massachusetts, and Maryland demonstrating strong quarter-over-quarter growth. In addition, the residential segment continues to be highlighted by consumer acceptance of third-party solar ownership models. The major state markets in California, Arizona, and Colorado all saw third-party residential solar account for greater than 70 percent of total Q2 2012 installations. U.S. Solar Market Insight: 2nd Quarter 2012 finds that in the California market, this quarter marks the first time that the average installed price of a third-party-owned system was lower than that of a system purchased outright: $5.64 per watt for third party versus $5.84 per watt for directly owned solar systems. In contrast to the utility and residential markets, the non-residential (e.g., commercial, government, non-profit) segment contracted, falling from 291 megawatts in Q1 2012 to 196 megawatts this quarter. Although California (down 45 percent) and New Jersey (down 35 percent) contributed to a large part of the decline, these states were not alone. Only ten of the twenty-four states the report tracks individually saw quarterly growth in the non-residential market in Q2 2012. This trend was likely due to a combination of factors. In some individual markets such as New Jersey, it was a result of state-market-specific factors such as SREC oversupply. In other states, Q1 2012 had been bolstered by safe-harbored 1603 Treasury Program installations. In addition to coverage of U.S. demand markets, U.S. Solar Market Insight: 2nd Quarter 2012 provides insight into the state of PV component manufacturing in the U.S. Global oversupply continues to be the chief challenge to U.S. PV suppliers, as wafer, cell, and module production in the U.S. fell 33 percent, 25 percent and 28 percent, respectively in Q2 2012 as a result.